Is it okay for Christians to listen to and enjoy secular music? I’ve been asked this question by many readers, multiple times. While deciding whether or not to listen to secular music, there are main factors to consider. First of all, is the purpose of music solely for worship or did God create it to also be entertaining? King David (the most famous musician in the Bible) used music in his worship to God. (Psalm 6:1, 54, 55, 61:1, and 67:1 are just a few examples) It was also used in 1 Samuel, in the story that I’m sure we’re all familiar with, where Saul called David to play the harp for him, because he was being tormented by evil spirits. The Israelites also used musical instruments during battle and to warn of danger. In the New Testament, we are instructed in Ephesians 5 and Colossians 3 to encourage one another in ‘psalms and hymns and spiritual songs’. So while music is primarily viewed as a form of worship in the Bible, it is most definitely allowed for other uses as well. Secondly, many secular artists are very talented. They perform well, are great entertainers, make catchy music, write songs that are thoughtful, insightful, and have positive messages. Not all are as ‘of the devil’ as a lot of Christians have said in the past. I will say, though, that much of secular music doesn’t match up to the standards in Philippians 4:8 regarding the purity and integrity of the mind. Many modern songs talk about things that go against God’s Word or are considered abominations in His eyes. Such songs as these, no Christian should listen to and glorify. But there are also secular songs that hold no mention of God and are perfectly pure and enjoyable. Some love songs, for example, even promote the purity of true love but don’t even mention God or the Bible. These, I think, can be listened to and still enjoyed. 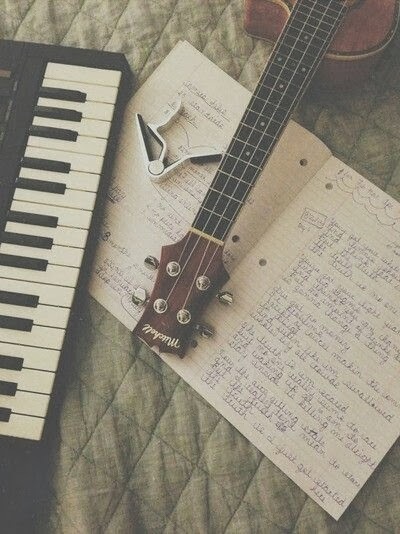 Music is such a passion of mine. And I consider my singing ability as a gift from God so what better way to worship Him than by using the talent He gave me? But does that mean that He will be angry with me if I choose to blast secular songs while I'm driving? Or listening to a film's soundtrack that is just instrumental? We are all convicted of things differently. These are just my personal thoughts. I will end with a warning and reminder: what a person listens to will eventually come out of him. It will control his way of thinking, his speech and his actions. It’s the lyrics of a song that are what should determine whether it’s something profitable or not for a Christian to listen to. For some, certain kinds of music is tolerable. While for others, it becomes a stumbling block and an addiction. We must keep Philippians 4:8 and 2 Corinthians 10:5’s words as our standards for the kind of music we should or shouldn’t listen to. Enjoy music for what God intended it for - to enjoy, entertain, and use for worship. Thank you so much. And yes, I agree with you. It's sad to see that some people view those so-called 'Christian' artists and bands as such when honestly, they're doing nothing to proclaim salvation or the Gospel. This Is a really good post! But as Jessica Joy said we must be careful even of "Christian" songs. There are some out there who would call themselves Christians but the lyrics of songs can be dodgy. There are some really nice songs out there both worship songs and songs that are just so nice to listen/sing to. Yes, I agree with her too. I totally agree with you. I don't think that non-christian music should be labeled as evil or anything of that sort. For me personally, I choose to listen to mainly Christian music since it puts me in such a great mood and gives me a better perspective on life when I hear it. There are a few pop and country songs that I like, however, and I would be comfortable with any music that has a positive and appropriate message. I appreciate your well thought out response to this issue. God bless! Thank you! And thank you for sharing your thoughts! :) God bless you too. Thank you so much:) Glad you enjoyed it! you do such a great job of explaining things like this. i totally agree with you but have many, many friends who definitely would not agree, and i never know how to explain my viewpoint. we just agree to disagree, haha. haha thank you so much:) And yes, I totally know what you mean. Feel free to share this article with them if you'd like to! I used to be one of the people that was very strict in think a Christian should only listen to Christian music. Now while I still think it is best to mainly listen to Christian music I don't think it's a sin to listen to good secular music with positive lyrics. I would like to make a point that has been mention and that is we need to be careful what secular artist we support. We don't want to be supporting artist that are living an immoral lifestyle or have songs with bad lyrics on some of there songs but not all of them (if we only listen the goods songs and don't realize they have bad ones we could be doing this without know it). So what I'm getting at is it would be to be informed about the artists and all the songs they have before supporting them. Just because I may listen to a certain secular band or artist doesn't mean that I support everything they stand for or their lifestyle. There's a difference between loving the creation or the creator, right? When it comes to certain secular songs that I like, I may just enjoy the song itself, but not condone the singer's actions or way of living. Does that make sense? Very thought provoking post and I applaud you for your beliefs and your convictions and your striving for balance! Excellent article. I view secular music like chocolate. Chocolate is great to eat on occasions, some chocolate is healthier than others so you can set more of it, and it's okay to have a binge once in a while. But it should never be the primary staple of your diet. If we are what we eat, likewise we become what we listen to the most of. Great post, Raquel. I agree with your thoughts. Oh! I like that. Great example, Jasmine.